Have you played along in the TCPTUES challenge? It is a fun one and you don't want to miss it! This go around is all about Paper Piecing! I love paper piecing as it always adds some fun elements to your project. The Cat Pack has not held back in creating some fabulous projects to share with you and we'd love to have your creations uploaded to see and for you to have a chance to win! For my card, I used the set Oh Chute which I just adore. It is simply an adorable set and perfect for paper piecing. This is a CAS card with just a hint of fun with those stitched clouds! I do enjoy lots of white space and couldn't decide whether or not to add a blue background or not. Obviously, I decided to keep it white and just have the parachute and sentiment be the pop of color. The back layered panel is a light blue cs while I used some tie dye patterned paper for the chute. I cut out the clouds and popped them up before finishing it with the stamped sentiment. Don't forget to stop by the TCP Blog to see the DT's inspirations on this challenge. Thanks for stopping by and hope you have a great week! Are ready to play along in this weeks YNS sketch/color challenge? For some of you, it was a back to school week and you deserve a little creative time, don't you think? :) I admit, we are not back to school here in VA yet, but I know my time is coming. A little too fast actually. I am in denial that the Summer is coming to an end and that we will be back to homework, sports, and projects. However, schedules will be a nice comeback. But, enough about that! 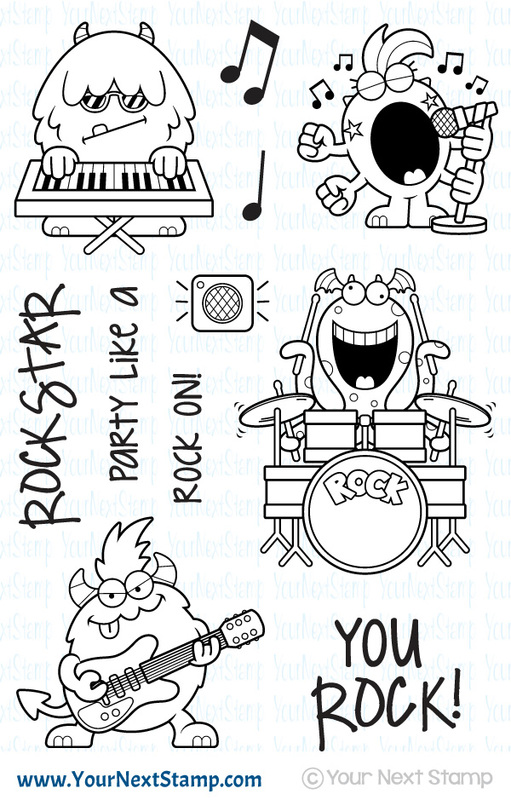 I decided to use the YNS Sketch for my card and used the newly released set of Silly Monster Rock stars. The image was stamped and colored in with Copics before cutting it out using the coordinating dies and popped up. I paired that with some papers from the newly released YNS Swirly Fun collection and added some music notes cut out with the dies. The sentiment was added by using some yellow embossing powder I have had for some time which added a nice pop of color. Be sure to stop by the YNS Blog for more inspiration using the challenge sketch/colors and we hope you will be able to play along! Don't forget to upload your project to the challenge site for your chance to win! Thanks for stopping by and hope you have a great weekend! Today is the start to the Your Next Stamp Design Team Showcase and we are featuring ideas in celebration to YNS' 7th birthday, related to Birthdays! Everyday this week there will be projects posted on the YNS blog to jump start your creative mojo. So, blow up those balloons and let's celebrate! I stamped some balloons on white cs to be fussy cut out so that I could decorate the front panel. The initial sentiment is kept simple so that it will be that invitation to want to open it up. I popped up the balloons and added some different color gumdrops to the outside. Let's talk about the elephant in the room... my handwriting! LOL! It is not the best, but realized that I did not have a "party planning" type stamp set. So I improvised and did the best I could with a marker. The topper was added with another balloon that is popped up and some twine. 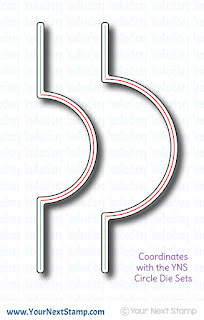 You could essentially make this any size you desire, but mine was kept close to an A2 size. Be sure to stop by the YNS Blog to see Holly's super cute idea for your rockstar! Thanks so much for stopping by and have a great week! Ceeeelabrate good times, come on! Hehehe... I couldn't resist and of course I sang it while I typed. But it is a time of celebration as YNS is celebrating it's 7th year and today the DT is featuring projects that revolve around celebrations. 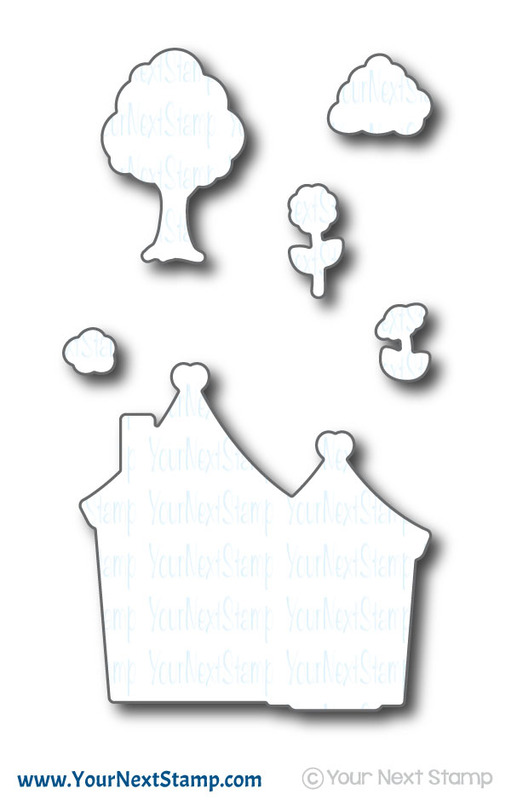 I just had to use the newly released set of Cute Home to celebrate a new home for someone. To add some additional elements to the background, I also used the new die called Circle Panel. This is an absolute must to your die collection. So many uses and I love how the center is intact so that you can use it for sentiments or whatever your creative mind comes up with. I started with some patterned paper from MME cut out using the Circle Panel die. That was layered on top of some kraft paper while the main image was stamped, colored with Copics, and cut out using the coordinating die set. Some silvery, grey colored ribbon was used while the house cut out was popped up over that. I fishtailed the sentiment banner and sponged the edges with Antique Linen Distress Ink to soften the bright white of the paper. It was finished with the fun clouds in this whole set to also be popped up above the house. Be sure to stop by the YNS Blog to see all the fun creations the team has come up with and leave a little love. You could be the winner of a stamp set of your choice just by leaving a kind comment! Thanks so much for stopping in! 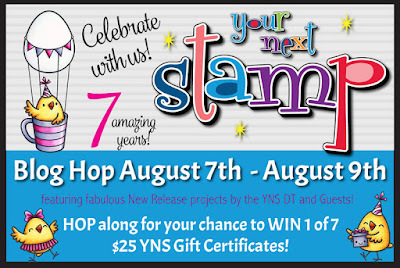 Your Next Stamp August New Release Birthday Bash! Can you believe that Your Next Stamp is celebrating 7 fabulous years? That's right! 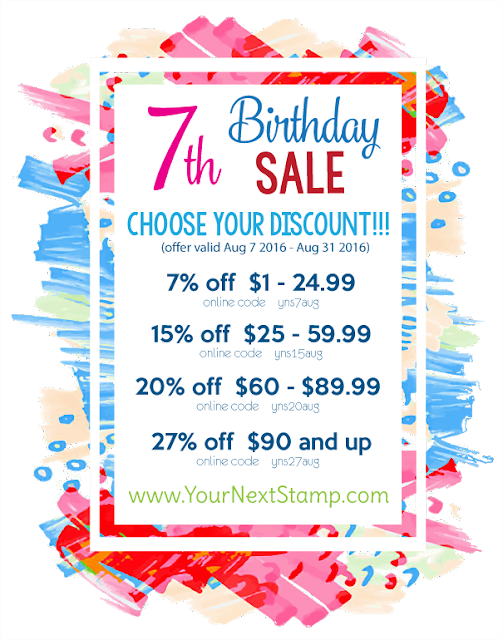 YNS is turning 7 and Karen has an awesome release to help celebrate as well as an awesome sale for you to save on your list of must haves. 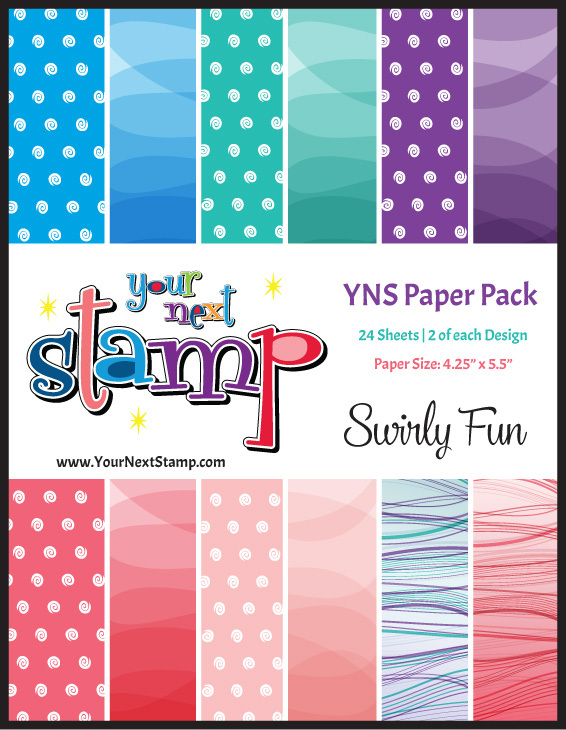 The most exciting part of this release is the wonderful new patterned paper called Swirly Fun. You won't be disappointed with the color combination of this new collection. It is perfect combination of patterns and ombre for any project. 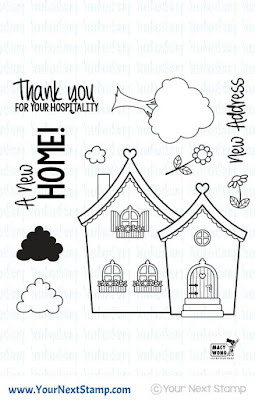 For my first project, I am sharing with you an address change card made using the new set called Cute Home. I started with a 5x7 sized panel which I layered with some patterned paper from EP and a white panel on top. The house was stamped and colored in with Copics, while the Lots of Dots Edge stamp was used to accent the bottom. Using the flower in the set, I made that to be the start of where the address change would go and left a little space at the bottom for a note or anything else that may want to be added. I love the versatility of this set for both a new home or a thank you for some hospitality. 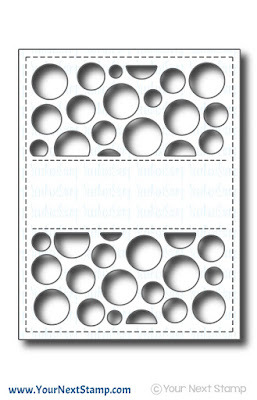 For the second project, I am using this super fun die panel called Circle Panel. Tell me this is not just so fun?! For this, I used the pink ombre styled paper in the new paper pack to lay behind the dotted panel. I cut out the butterfly using the Stitched Butterfly die and adhered it in the center only so the wings could be bent up a bit for texture. 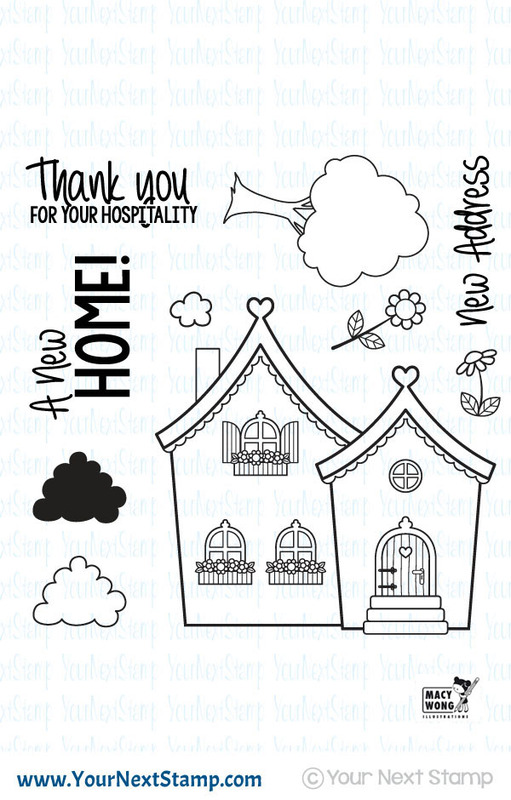 Using the new Cute Home set, I used a sentiment to make for a simple and cute thank you card. You don't want to miss the other wonderful projects, so be sure to hop along and leave a little love for your chance to win a YNS gift certificate. And Karen is not just giving away one, but 7 gift certificates worth $25 each! How's that for generous?! But that's not all! Check out the sale details below! Get everything on your wish list and the more you spend, the more you save. That's right! 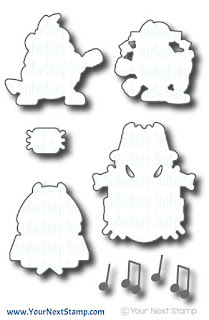 It's the August sneak peeks for Your Next Stamp there is a new surprise that is being released. 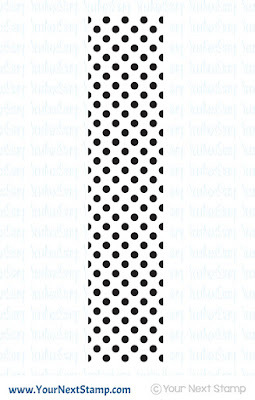 Karen has designed and is releasing some super fun patterned paper! This collection is called Swirly Fun. How awesome is that?! The DT members are so excited to share with you all during this sneak peek creations made with the unique paper designs. 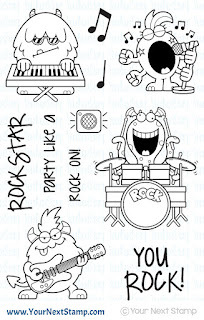 For my card, I am using the new set of Silly Monsters Rockstars, the ever fun new Half Circle Flip die, and of course the fun new patterned paper. I used the flip die in a more non-traditional form for this kind of design by creating a card that opens in a normal fashion but continues to show the main image. 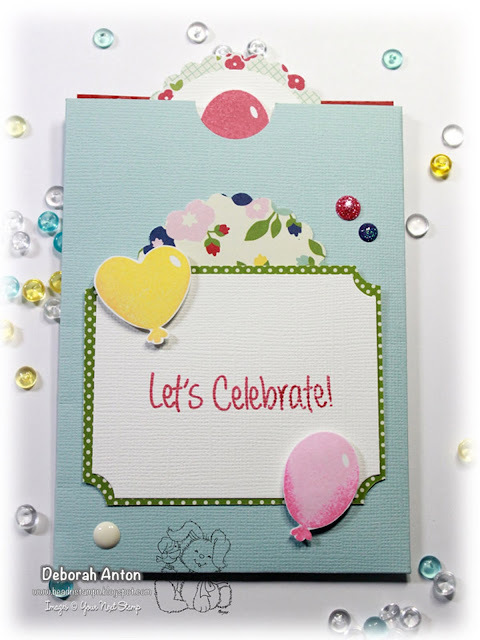 The inside is layered with some of the new YNS patterned paper while the image is stamped, colored with Copics, and cut out using the coordinating die set. I also used the YNS plain and stitched circle dies to layer onto the flip. Once the monster was colored and cut out, I popped him up with the speaker. Using the music notes, I stamped over the front of the card and added a thin strip of the patterned paper to the edge of the card. These guys are so much fun! 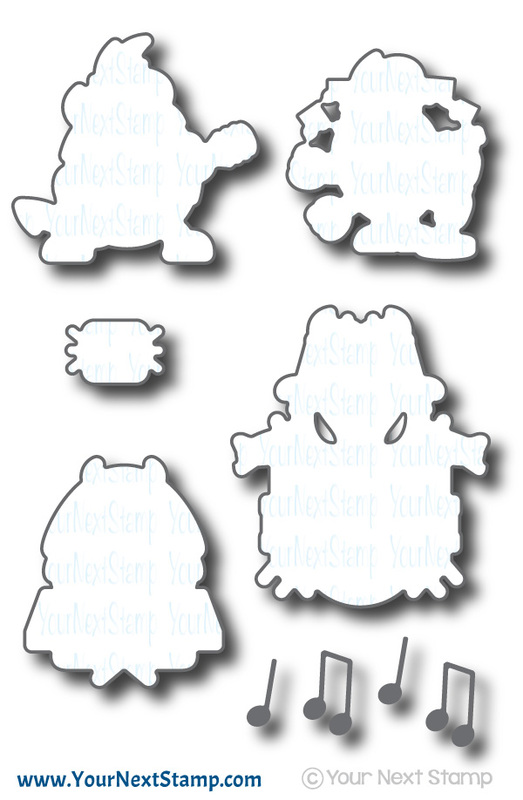 Don't forget to stop by the YNS Blog to see the fantastic creations the DT have put together and to see what other awesome sets are being released this month! Thanks for stopping by! Have you taken a peek over at the YNS weekly sketch and color challenge? With the sketch, there are so many possibilities that can done with the open spaces. 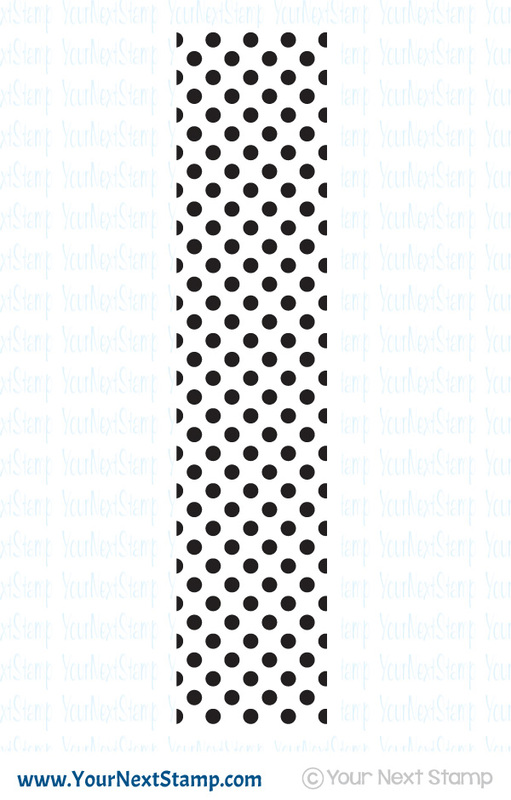 For my card, I went with a nautical theme to match the very fun Flip Flop die in a summer, beachy, holiday kind of way. Using some patterned paper from Authentique, I placed the life saver paper as the focal paper against the flip flop die which is popped up against the coordinating stripe paper. I used the Top It Off die to accent the main panel and kept with the red, white, and blue combination. The cute butterfly flip flop topper were added to cute-sy it up. The card was finished with some matte gumdrops and a sentiment from the Cool Tag Banner Sentiment set. We hope you come along to play in the challenge and link you creations to the YNS Challenge blog. You just might win a gift certificate to the YNS Store! Thanks for taking a peek and have a great weekend. The August new release sneaky peeks are tomorrow, so you don't want to miss out on that!